Judith Arlene Resnik (April 5, 1949 – January 28, 1986) was an American engineer, pilot and NASA astronaut. She died when the Space Shuttle Challenger was destroyed during the launch of mission STS-51-L. She was also aboard Space Shuttle Discovery for its first mission, STS-41-D in 1984. She spent 145 hours in space. She was the first Jewish American in space and the first Jewish woman in space. Resnik was born in Akron, Ohio. Her family was Jewish. She earned degrees at Carnegie Mellon University (B.S.) and the University of Maryland (Ph.D.). She was married to Michael Oldak from 1970 until their divorce in 1975. On January 28, 1986, Space Shuttle Challenger broke apart 73 seconds after launch. Resnik and all six others aboard died. ↑ "Biographical Data" (PDF). NASA. December 2003. Retrieved March 23, 2019. 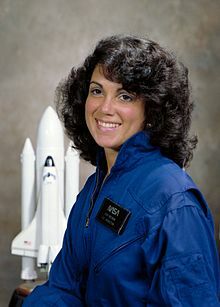 Wikimedia Commons has media related to Judith Resnik. This page was last changed on 23 March 2019, at 20:32.